Although there are many initiatives to improve maternal health services use, utilization of health facility delivery and postnatal care services is low in Ethiopia. Current evidence at global level showed that antenatal care increases delivery and postnatal care services use. But previous studies in Ethiopia indicate contrasting results. Therefore, this meta-analysis was done to identify the effect of antenatal care on institutional delivery and postnatal care services use in Ethiopia. Studies were searched from databases using keywords like place of birth, institutional delivery, and delivery by a skilled attendant, health facility delivery, delivery care, antenatal care, prenatal care and postnatal care and Ethiopia as search terms. The Joanna Briggs Critical Appraisal Tools and the Preferred Reporting Items for Systematic Review and Meta-Analyses were used for quality assessment and data extraction. Data analysis was done using STATA 14. Heterogeneity and publication bias were assessed using I2 test statistic and Egger’s test of significance. 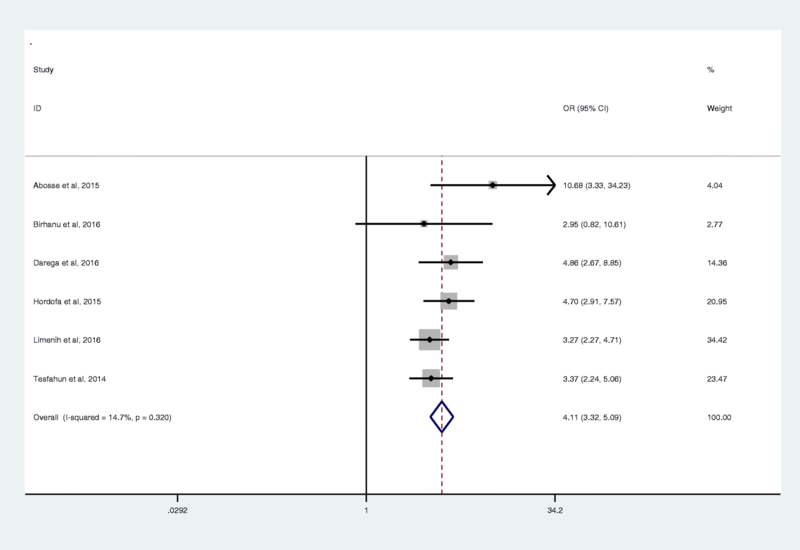 Forest plots were used to present the odds ratio (OR) with 95% confidence interval (CI). A total of 40 articles with a total sample size of 26,350 were included for this review and meta-analysis. Mothers who had attended one or more antenatal care visits were more likely (OR = 4.07: 95% CI 2.75, 6.02) to deliver at health institutions compared to mothers who did not attend antenatal care. Similarly, mothers who reported antenatal care use were about four times more likely to attend postnatal care service (OR 4.11, 95% CI: 3.32, 5.09). Women who attended antenatal care are more likely to deliver in health institutions and attend postnatal care. Therefore, the Ethiopian government and other stakeholders should design interventions that can increase antenatal care uptake since it has a multiplicative effect on health facility delivery and postnatal care services use. Further qualitative research is recommended to identify why the huge gap exists between antenatal care and institutional delivery and postnatal care services use in Ethiopia. About 303,000 mothers died from pregnancy and childbirth related causes in 2015. Majority (99%) of the deaths occurred in developing countries. Most of these deaths were from Sub-Sahara Africa [1, 2]. In Ethiopia, an estimated 11,000 mothers died due to pregnancy and childbirth related causes in 2015 [1, 3]. Globally, the major causes for maternal mortality are obstetric hemorrhage, hypertension, abortion, sepsis, HIV, preexisting medical disorders and other indirect causes like anemia [2, 4–6]. These are also causes of death for Ethiopian mothers [3, 7–10]. Most causes of maternal and child deaths are preventable or treatable with proven, cost-effective interventions [11–17]. A study conducted in India showed that 90% of maternal deaths would have been prevented if immediate decisions and appropriate care had been given at the time of delivery . Provision of effective delivery care can prevent 113,000 maternal deaths annually . Antenatal, delivery and postnatal care are among the key health sector interventions for maternal and child survival [20–28]. Many studies identified that antenatal care interventions reduce maternal and child mortalities and morbidities [29–34]. Institutional delivery can reduce the risk of neonatal mortality by 29% in low and middle-income countries [35, 36]. A study done in Southern and central India showed that increased institutional delivery is associated with decrease in stillbirth and perinatal mortality . Similarly, skilled attendant at delivery can prevent and treat life-threatening conditions that may occur at the time of delivery [38–41]. Postnatal care is also a crucial time to tackle most causes of maternal and child mortality [42–45]. The Ethiopian government developed many strategies and programs to improve maternal and child health. For example, all maternal health services are provided free in Ethiopia [45–48]. The Health Extension program is another strategy which brought a tangible effect on family health [48, 49]. The Ethiopian government set an ambitious plan to increase four or more ANC visits, delivery and postnatal care services use to 95, 90, and 95% respectively at the end of 2020 although the current level of these services use is low [50, 51]. Antenatal care is an opportunity to promote mothers to use other maternal health services [34, 45, 52, 53]. Women who attended ANC are expected to use health facility delivery and attend postnatal care services. Yet, the situation is different in Ethiopia. According to the 2016 Ethiopian demographic and health survey, the proportion of women who attended ANC, health facility delivery and postnatal care is low compared to the national targets. Moreover, the proportion of mothers who delivered at health institutions (26%) and attended postnatal care (17%) is much lower than those who attended ANC (64%) [50, 51]. Therefore, this review and meta-analysis were done to identify the effect of ANC on institutional delivery and postnatal care services use in Ethiopia. 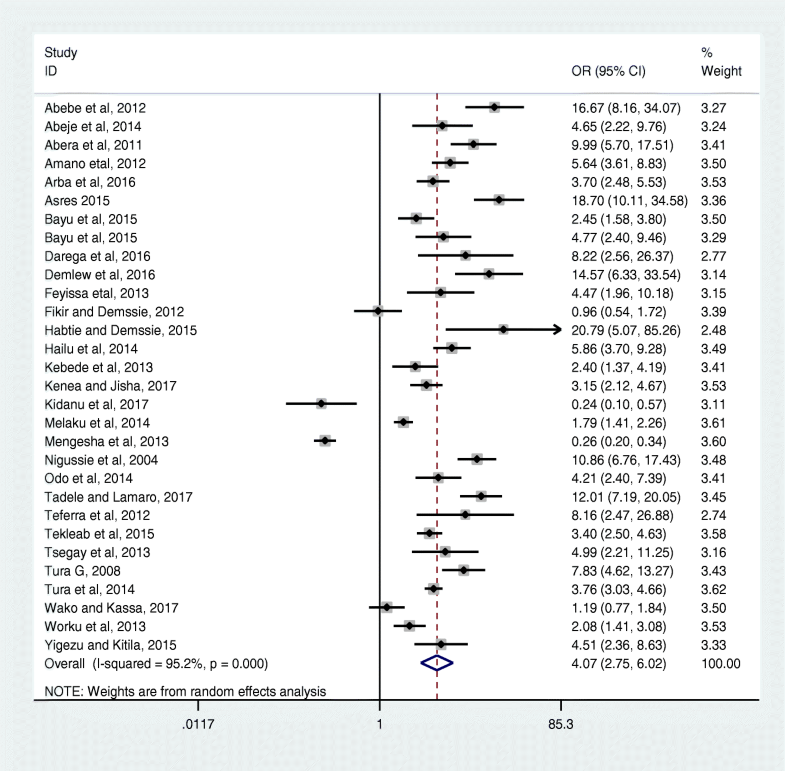 The result of this review and meta-analysis will help to identify whether antenatal care attendance has an effect on health facility delivery and postnatal care services use in Ethiopia. We used the EndNote software and searched databases to retrieve studies for this review and meta-analysis. The search terms used were: place of birth, institutional delivery, delivery by a skilled attendant, health facility delivery, delivery care, antenatal care, prenatal care and postnatal care and Ethiopia. The main databases searched were PUBMED, MEDLINE, Google Scholar, web of science and African journal online (AJOL). After identifying the key literatures, their references were screened to retrieve additional articles. To evaluate the quality of the papers, the Joanna Briggs Critical Appraisal Tools for review and meta-analysis was used. The AACODS (Authority, Accuracy, Coverage, Objectivity, Date, and Significance) was used to evaluate the quality of the articles [54, 55]. The following criteria were used to include studies in this meta-analysis. Place of study: studies that were conducted in Ethiopia regardless of the study setting (community-based or institution based). This review was conducted from July 15 to September 05, 2017. 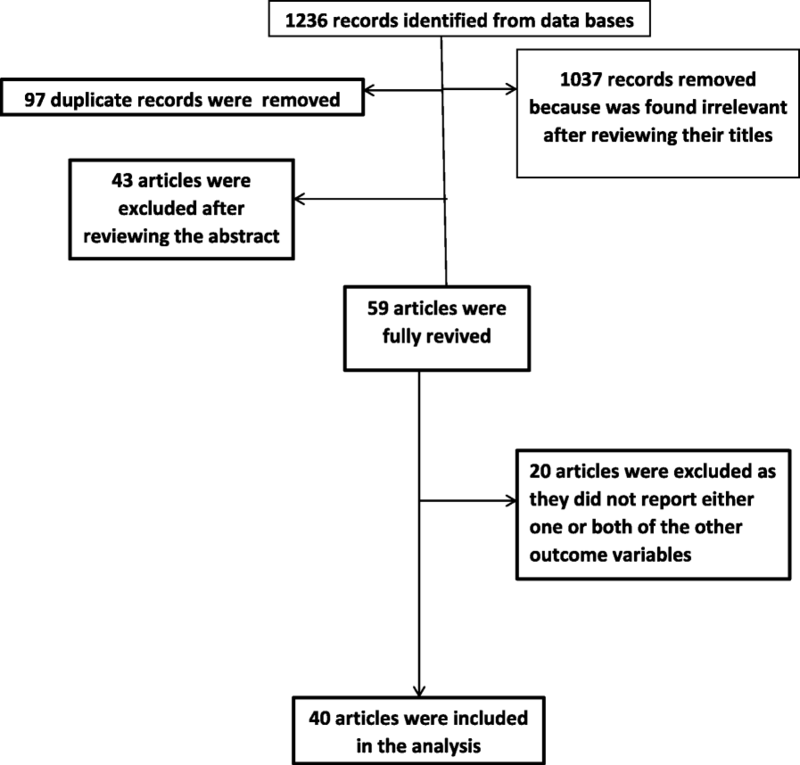 The review followed the Preferred Reporting Items for Systematic Review and Meta-Analyses (PRISMA) flow chart to identify and select relevant studies for this analysis. Initially, duplicated retrievals were removed. Then, studies whose titles were irrelevant for this study were excluded. After that, the abstracts were assessed and screened based on the exposure and outcome variables. At this stage, studies that were not relevant for this analysis were excluded. For the remaining articles, the full text was assessed. The eligibility of these articles was assessed based on the pre-set inclusion criteria. When articles did not have adequate data, corresponding authors of the research articles were contacted. All authors conducted the review independently and an agreement was reached through discussion when needed. Heterogeneity among the included studies was checked by using I2 test statistic . Heterogeneity was declared at p ≤ 0.05. Publication bias was also checked by using Egger’s test. A p-value of less than 0.05 was used to declare statistical significance of publication bias . 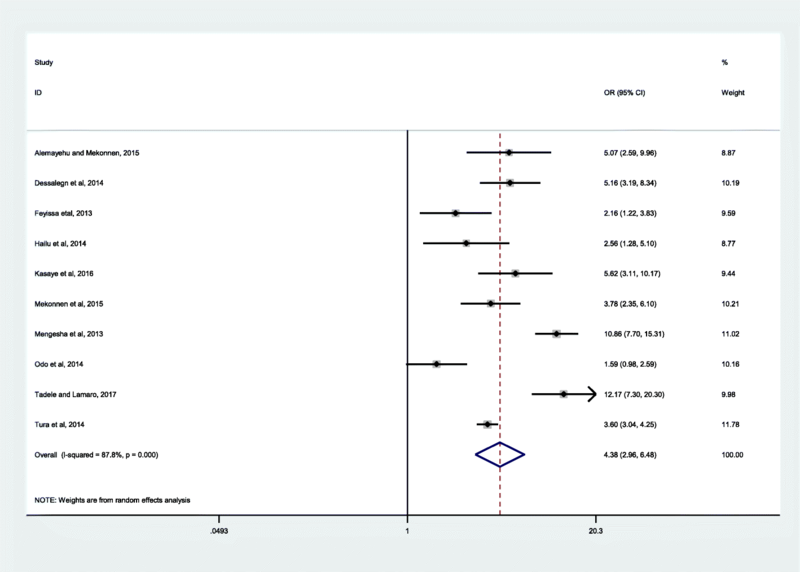 For studies which showed the presence of publication bias, the Duval and Tweedie nonparametric trim and fill analysis was conducted to account for the publication bias . The analysis to identify the effect of ANC visits on institutional delivery service use was divided into two parts. The first analysis was to identify the effect of one or more ANC visits on institutional delivery service use and the second was an analysis of the effect of four or more ANC visits on institutional delivery service use. Data were extracted from each study using data abstraction format prepared on Microsoft Excel. Then, the data were exported to STATA 14 for meta-analysis. A total of 1236 records related to the review topics were identified. Ninety articles were removed because they were duplicates. Another 1139 articles were removed from the list after screening their title and abstracts. Then, full article review and screening was done for 59 studies. From these, a total of 20 articles were excluded for not reporting one or more of the outcome variable. Finally, 40 studies were included in the analysis (Fig. 1, Tables 1, 2 and 3). The studies were conducted from 2011 to 2017. Most of the studies were from the four major regions of Ethiopia, 11 from Oromia, 17 from Amhara, 4 from Tigray and 5 from South Nations, nationalities and people’s regional state. The sample size of the included studies ranged from 281 to 3472 participants. In terms of study design, all except three were cross-sectional (Tables 1, 2 and 3). A total of 30 studies with 26,350 sample size were included to estimate the effect of ANC on institutional delivery service use. The study populations for all the 30 studies were reproductive-age women who were pregnant or had given birth within 5 years of the survey. The studies were conducted from 2004 to 2016 (Table 1). Three of the studies were case-control [59–61] and the remaining 27 studies were community-based cross-sectional or follow up studies [62–88]. This analysis identified that mothers who had one or more antenatal care visits were about four times more likely (OR = 4.07: 95% CI 2.75, 6.02) to deliver at health facilities compared to mothers who had not attended ANC (Fig. 2). Additionally, ten articles were included to assess the effect of four or more ANC visits on institutional delivery service use. The studies were conducted from 2013 to 2017. The total number of women included in this analysis was 8524. Two of the studies were case-control [59, 60] and the other eight were cross-sectional studies [64, 67, 76, 86, 89–92]. The sample size of the studies ranged from 320 to 3472. The studies included in this subgroup analysis showed high heterogeneity (I2 = 87.8, P ≤ 0.001) but non-significant publication bias (Egger’s test = 0.780). Using the random effect model analysis, women who had four or more ANC visits were 4.38 times more likely to deliver in health facilities compared to women who reported fewer ANC visits (OR 4.38, 95% CI: 2.96, 6. 48) (Fig. 3). Six articles with a total sample size of 4047 women were included in this analysis. All except one (institution based) were community-based cross-sectional studies [79, 93–97]. There was no statistically significant heterogeneity and publication bias among the studies (I2 = 14.7, P = 0.320 and Egger’s test = 0.231, respectively). The analysis indicated that mothers who attended ANC were about four times more likely to use postnatal care service (OR 4.11, 95% CI: 3.32, 5.09) (Fig. 4). Antenatal care has been used as a strategy to reduce maternal and neonatal morbidities and mortalities. Various approaches and strategies have been implemented to improve the effectiveness of ANC in developing countries [52, 98, 99]. Currently, most developing countries including Ethiopia are using the focused ANC approach which was developed by WHO [100, 101]. This study identified that women who attended ANC were about four times more likely to use institutional delivery services. This finding was in line with a meta-analyses conducted in Africa [102, 103] and DHS based data analysis in Nigeria . The reason for this finding is that ANC is an opportunity for health promotion . Therefore, women who attended ANC are more likely to have better information about benefits of institutional delivery service use and this may have impacted the subsequent health service use. Additionally, pregnant women attending ANC have the chance to acclimatize to the health facility environment. This may have helped them avoid unnecessary fear and stress related to institutional delivery service use. Furthermore, mothers who attended antenatal care are more likely to be better informed about danger signs and obstetric complications which may arise during labor and delivery. Antenatal care is also an opportunity for a pregnant woman to establish an informal forum which will help them to discuss and share information about their pregnancies and benefits of health facility delivery [46, 50, 57, 58]. The subgroup analysis showed four or more ANC visits had a similar effect on health facility delivery compared to fewer ANC visits. The reason for this may be that health professionals in developing countries provide all the information and health promotion activities needed for the mother on the first visit to avoid missed opportunities as the woman’s return for the subsequent visits is not guaranteed [51, 105]. The current review also found that women who attended antenatal care were more likely to use postnatal care services. This finding is similar to studies conducted in Nigeria, Nepal, and Zambia [104, 106, 107]. It is theoretically plausible to think that mothers who attended ANC had received adequate counseling and information about postnatal care during the ANC session. Additionally, women may set birth plans in consultation with the ANC provider which in turn will increase delivery and postnatal service use . This review had large sample size, which meant that it could detect the effect of ANC on institutional delivery and postnatal care services use. The analysis included all studies conducted in Ethiopia. But this meta-analysis does not address other factors that affect institutional delivery service use and postnatal care. In addition, this meta-analysis did not answer why institutional delivery and PNC services use remained low compared to ANC services use in Ethiopia. Evidence to identify the effect of ANC on PNC is limited. Therefore, we recommended further studies to identify the root cause for the huge difference in the proportion of women who attended ANC and PNC. This review and meta-analysis revealed that mothers who attended ANC are more likely to use institutional delivery service and postnatal care. Mothers who attended ANC visits were more likely to deliver at health institutions. Similarly, women who attended ANC were more likely to attend postnatal care services. Therefore, the Ethiopian government and other stake holders need to exert collaborative effort to increase ANC service use since it has multiplicative on delivery and postnatal care services use. The authors would like to thank all the authors and publishers of the original studies. GAF conceived the study. GAF and all others (GMK, AKB, AAM, and NAK) involved in the abstraction of the data, analysis, and writing of the study. The final manuscript was read and approved by all authors. GAF is an assistant professor of Reproductive and Child health in Bahir Dar University, School of Public Health. GMK, AKB, AAM, and NAK are lecturers in Debremarkos University College of Health Sciences, Adigrat University, College of Health Sciences, University of Gondar, Institute of Public Health and Wolaytasodo University College of health sciences respectively.